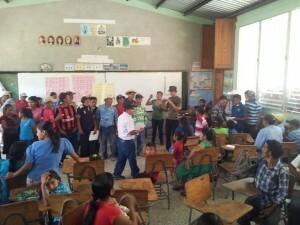 The following is a blog entry from ENCA member James Watson during the months of June and July 2015 when he accompanied the Honduran organisation COPINH (Civic Council of Popular and Indigenous Organisations of Honduras). 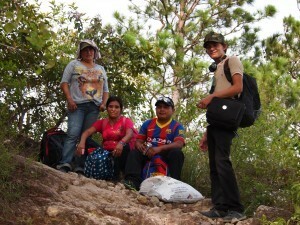 The COPINH group – Maryeli, María, Agostín and Selvín. A couple of days after arriving in La Esperanza, COPINH invited me on a trip away from their base in the town, to visit one of the communities that serve as their main focus fighting for indigenous rights in Honduras. San Marco de la Sierra is a mountainous area just south of La Esperanza. Its inhabitants are campesino farmers whose livelihood is primarily subsistence agriculture, working family plots of land on precipitous mountainsides. Although close on the map, the journey from La Esperanza takes 5 hours, half of it driving on crumbling highways and winding mountain roads, and half walking on treacherous slopes in the thick Honduran heat. When heavy rains wash out the road the community can be completely isolated for weeks. COPINH has been active in various struggles for San Marco’s indigenous and human rights over the years. On this trip, COPINH was returning because of a new threat to their land, water and environmental and spiritual heritage. Hydroelectric dams are a difficult issue for environmentalists. At first sight, they represent a good clean source of renewable energy – much needed to avert climate change. However, they have are not without a significant negative impact. Physically, they involve some loss of land to the artificial lakes they create, and can involve homes being dispossessed – although this depends on the size of the dam and the nature of its surroundings. They interrupt and control the flow of water downstream, which can interfere with water supplies to communities and the environment – but on the other hand they can be tools to manage extremes of flooding or drought. In reality, hydroelectric projects need to be seen in their specific socioeconomic context. The proposed San Marco project will put five dams along the stretch of the San Juan River which runs through the region. The companies and Honduran officials involved say the individual dams will be quite small, with minimal physical impact. But the overall context of regional money and power paints a very different picture. The dams are among hundreds that have been planned throughout Honduras since the current corrupt government passed a law allowing the privatisation of water resources. Water is precious in Central America. It is essential for communities to live on, but it has increasingly become a commodity to be owned and extracted for Western companies. Hydroelectricity, mining (which uses vast amounts of water for mineral extraction and contaminates it in the process) and soft drinks production have made it more valuable in the hands of companies than communities. In fact, hydroelectricity is fundamentally connected to mining in Honduras. A significant part of the country’s hydroelectricity generation is channelled straight into new mining projects – which the current government has extended to include over 30% of the nation’s land-area! Water is now just one of the many valuable resources abundant in Central America being sold at rock bottom prices to foreign “investors”. Honduras leads the way internationally for opening itself to this sort of ‘investment’. But the Honduran oligarchy that negotiates this business has more interest in its own wealth and in importing the trappings of European and United States society, than it does in helping its own country to develop. As such the wealth that should roll into the country in return for its resources is a mere trickle, and goes straight into private bank accounts which are used to buy foreign products. This simple reality is key to understanding why in many ‘developing’ countries around the world, top-down, investment-led, ‘trickle down’ economics has completely failed to improve the lives of anyone but the richest elites. When it comes to the remote indigenous in Honduras however, the most important perspective is that of local power, land and culture. Although the San Marco project officials say the dam will be small, it will carve out sections of the land and river and surround them in fences, blocking access for the campesinos. It will impose a new power structure of owner vs owned on their land. The indigenous Lenca live off the land and value and protect it. Traditionally they own it as communities, not collectives. The rivers have a deep spiritual significance to them and are part of their identity. The communities in San Marco have not been consulted in any way about what the project will entail – in a casual dismissal of international law. Put simply, the dam organisers do not value the campesinos’ opinions, their way of life, or even their existence. COPINH has fought countless battles against other dam projects. Countless times they have faced violence, intimidation and murder, with officials set to profit from projects paying off community members, private security guards and the military to do their dirty work. Hydroelectric dam projects in Honduras are as dirty and destructive as any other grand extractive undertaking in this most exploited of countries. I went to San Marco with 4 COPINH members – Selvín, Maryeli, María and Agostín – who were expected at a community meeting to discuss the damming project. We spent 2 nights in the community, in a beautiful and remote mountain setting as green as any movie rainforest setting. The day in the community was busy from dawn until dusk, my companions giving a string of presentations to inform the community of their experiences of dam projects elsewhere. San Marco’s isolation puts information at a premium. TV is not available, but radio is, and among other stations COPINH’s community radio can be received in the mountains. COPINH has an important role in providing information that strengthens the community. They are especially vulnerable to promises and misinformation from the companies involved in the dam building, and several community members have already been contacted with promises of money. It is a common tactic across Latin America for companies concerned about potential resistance to their plans to buy out individuals in order to divide and weaken the autonomy of communities. The COPINH meeting was mainly aimed at bringing their experience of the reality of Honduran dam projects to prepare San Marco for such interference. The meeting was well attended, with over a hundred people some of whom had walked for 4 hours to be there. Here the group are participating in a discussion of the ILO’s Convention 169 on Indigenous Rights, and what it means to them.Selvín and Maryeli talked about other dam projects in general, and then María spoke. She is from Rio Blanco where COPINH’s indigenous organising has recently stopped the Agua Zarca project – a success which gained COPINH’s general coordinator Berta Cáceres the Goldman International Environmental Prize. 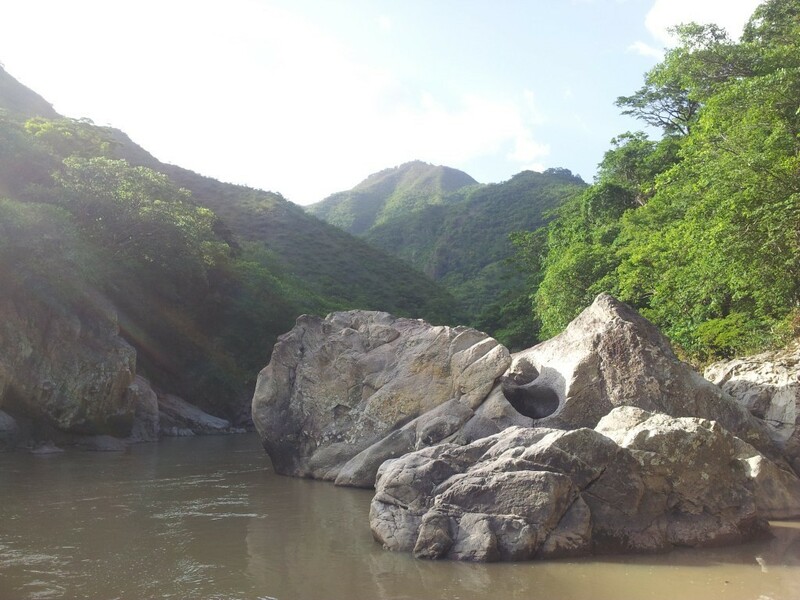 But Rio Blanco still faces violence from Agua Zarca’s vested interests. María has been attacked twice and threatened with death. She told me that she has machete scars on the top of her head from an attempt to kill her. Her right hand is bandaged with half a finger missing – brutally cut off in an assault just a few weeks ago which has forced her to go into hiding in La Esperanza. I was also honoured to be asked by COPINH to speak to the meeting. In my clumsy Spanish I talked a little about the international context – about the ‘trickle down’ model of development and how it is used in my country to justify exploitative extractive projects in ‘developing’ countries, without actually producing any development. Thankfully though, I didn’t have to speak for long, and as everyone was dropping off we took that opportunity to walk the 30 minutes down to the river itself to swim and enjoy what San Marco was fighting for. The day after the meeting, we travelled back to La Esperanza. That was a week ago, but this week COPINH received the appalling news of the murder of 2 people from the San Marco community that we stayed in, and the disappearance of another. As yet I haven’t heard anyone confirm what happened or why. But it seems unlikely to be a coincidence in such a small community that it happened at this time of conflict. The suspicion is that the dam companies and the municipal government that is in business with them have already found community members to coerce with money and promises, enough to use murder to break any opposition. This is the model used throughout Honduras, including in Rio Blanco, and it seems this violence is never far away. It was a shock to hear that such a beautiful and seemingly peaceful place had been hit so brutally by violence. That is simply the shameful reality underneath the clean and prosperous promises of hydroelectric dam projects in Honduras. Small-scale alternatives – is size important? Costa Rica’s environmentalists caught in a quandary – the climate or the parks?